The Feather Safety Razor is the very best traditional, double-edged safety razor you can buy today. If you can afford one, buy one, it’s as simple as that. They're made from solid stainless steel in Japan to the very highest engineering tolerances possible, each razor is a flawless example of Japanese engineering. The elegant, simple design typifies the fuss-free lines the Japanese are famous for, while the razor will deliver the most super-close, comfortable shave you can imagine. There is no fuss, no drama, with a Feather razor, it just works. The Feather AS-D2 is a true classic in the world of shaving. Made from stainless steel and finished in a brushed satin finish, this razor is a truly high precision instrument. It is the pinnacle of safety razor performance. It delivers an effortless, close, smooth shave without any fuss. The Feather AS-D2S is the best option as it includes the bespoke stand for the razor. Feather does not sell this stand separately. The Feather WS-D2S takes the Feather double-edged safety razor to a new level. Originally launched in 2015 and made from high grade stainless steel and treated hardwood; it is perfectly weighted and will deliver a mild, smooth yet very close shave. The dark coloured hardwood has been treated with a waterproof resin. It will not deteriorate over the years. All Feather safety razors are compatible with standard double-edged safety razor blades. However, they are really designed to be used with the peerless Feather DE razor blade. The combination of a mild shaving razor and an extremely sharp blade makes for a highly effective shaving tool. 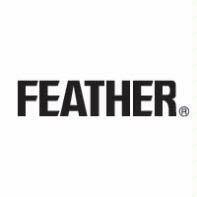 If you have any questions about Feather razors, don't hesitate to get in touch. 'Phone us on +44 (0)141 880 3040, use the LiveChat option, or email info@executive-shaving.co.uk.